Footage shows a huge crane crashing to the ground at Barcelona Port after being hit by an out-of-control ferry. The vessel called Excellent operated by Italian firm Grandi Navi Veloci which was carrying 420 passengers, hit the the crane at speed after being pushed off course by high winds. The collision caused a blaze which led to firefighters evacuating the area. Authorities confirmed no injuries, although two people are said to have been treated by medics after suffering a panic attack. Sixty were due to leave the vessel at port and another 115 were due to board the ship bound for Tangier, Morocco. The fire was brought under control around 11am local time. A local port workers' union tweeted: 'The ship Excellent, operated by GNV Traghetti, has had to abort its docking manouevre because of the bad weather conditions. The fire is thought to have started after the crane hit a fuel deposit behind it as it crashed to the ground. It affected several containers by the port-side, forcing local authorities to activate an emergency response plan because two of the containers contained dangerous chemicals. Black smoke rising from the scene of the collision, which happened just after 8am this morning could be seen across Barcelona. In January a huge ferry hit a cruise liner in the same port after apparent engine failure. The collision between the roll-on roll-off Fantastic ferry belonging to the Italian shipping company Grandi Navi Veloci and the Viking Star cruise ship sparked initial fears a major rescue operation would have to be launched. Fortunately no-one was injured in the incident on January 13. Footage of the collision taken by a dock worker showed the Fantastic ferry's stern rammed against the side of the Viking Star as both vessels blasted their sirens. The Italian ferry had reportedly lost engine power while docking in the port's B Terminal, from Tangier in Morocco. 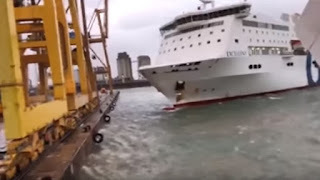 The Fantastic ferry is said to have dropped an anchor to try to stop its drift without success before it hit the left side of the 750-foot-long Viking Star, which is operated by Norwegian-owned Viking Ocean Cruises and had docked in Barcelona from Valencia with 820 passengers on board ahead of a stop in Marseilles.